A good gun dog is worth his weight in gold. Hunters always remember the best dogs they’ve owned. Those dogs that seamlessly became an extension of the hunter — one that practically read its owner’s mind. Those are the gun dogs of legend. In this gun dog blog, we look at some of the best ways to train your hunting companion so that you, too, have a gun dog of legend. The hunting process is complex and the role that a good gun dog plays is important. Before you can get them to retrieve dead waterfowl, you have to get them to obey. There are two factors that hunters need to instill in their dogs — obedience and steadiness. Obedience begins with the “stay” command. Make the pup stay while you do the retrievals. Letting the dog watch you work instills the idea that they do not need to retrieve every dead bird or fowl dummy. This takes the exuberance out of the dog and enhances the dog’s calm nature. Still, the entire process begins with obedience. A gun dog that does not obey will never be steady. Steadiness is a skill that is essential. It means that a dog will stand-down while another dog does the work. When training puppies, it is important that they obey, especially when it comes to retrieving. What this teaches the dog is restraint. Every dead bird does not need retrieval as soon as it hits the water. Restraint takes the over-excitement out of a dog and allows it to function without the pressure of performing at peak efficiency. Calm and steady are a win for the hunter and the dog. We discussed the “stay” command – and that is an essential skill – but it is not the only skill. Once the dog is in action you need to have it “come” when called or signaled. Gun dogs of legend obey. They stay, come, heel, and fetch, but they do it on command. The only way to effectively train a gun dog to obey is with trial, reward and yes, punishment. That does not mean cruelty because a good bird dog should not fear you; they need to respect you. And that is achieved through favor and disappointment. Personality and demeanor are two traits that bird hunters need to carefully evaluate before choosing a dog. Poor breeding practices have really opened up Pandora’s box. What we have now are dogs that are hyper. You cannot train that out of them as it just becomes nervousness and eventually a psychosis. A hyper dog constantly has to battle between its hyper nature and obeying its master. These are not gun dogs of legends. Start with good stock and many of your training issues disappear. Good trainers do not need training devices. Those products, such as electric collars are training aids. If they are to work, you will first need to know how to train a gun dog. The role of a trainer is to teach. Training devices do not do that. They do not provide the dog with skills. Gun dogs of legend existed long before there were training devices. The best advice is not to rely upon a device to train your gun dogs. Instead, rely upon skill. Just like with people, puppies need to develop in order to learn. By knowing your dog and watching its personality, you can feel when the dog is ready to learn. Start with the basics — sit, stay, fetch and come. When they have mastered those, move onto the more complex situations like stand down. It is hopelessly frustrating for both the hunter and the dog when you try to teach a dog skills before it is cognitively ready. Making a good gun dog is a reflection of the trainer. It is important that you start small and work into teaching harder skill sets. Another good tip is to socialize your pups when they are young. 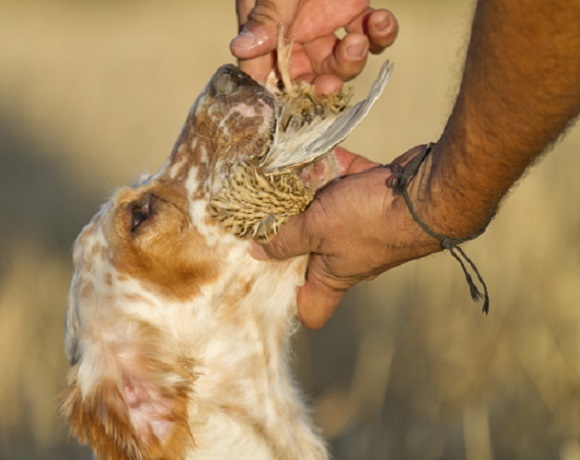 If you are new to training hunting dogs or have had problems in the past with bird dog training, step back and focus on making yourself a better trainer. We hope that these tips help you create your own gun dog of legend.